X Factor losers One Direction are set to see their debut single go straight to number one. What Makes You Beautiful is on course to sell more than 100,000 copies in its first week, putting it alongside this year's other big sellers like Grenade by Bruno Mars and Louder by DJ Fresh, according to figures from the Official Charts Company. 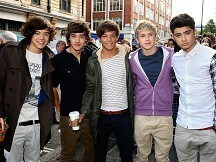 Simon Cowell has predicted big things for the group, saying they could become the biggest boyband since Take That. He said the five-piece, who came third in the last X Factor, were "going to ignite big time". Cowell said: "You're going to see an explosion happen here the likes of which we haven't seen since Take That and I think that's exciting. "There is just a buzz in the air. I can feel it at the moment." Matt Willis is joining the cast of West End musical Wicked.The former Busted star will be playing Fiyero in the stage production, billed as the "untold story of the Witches of Oz". Chart star Mr Hudson and presenter Miquita Oliver were among the guests at a party to celebrate rock legends Nirvana. Maverick Sabre has described performing at the Arthur's Day celebrations in Dublin as a "homecoming" gig. Amy Winehouse's father Mitch has revealed the fight to get her off drugs often turned physical, as he tussled with the dealers and gangsters who were supplying his daughter. Amy Winehouse's mother said her daughter would have been "proud" of a charity launched in her name which aims to help vulnerable young people. Lady Gaga, Coldplay and Elbow are to top the bill for a huge Children In Need concert organised by Gary Barlow. Neil Young's latest concert film is so up close and personal it leaves the audience viewing the rocker through his own spit. Amy Winehouse's father Mitch has told how his daughter suffered seizures as a result of her battle with alcohol.